An automation scripts that prompts you is a letdown, to say the least. Lately I have been playing around with the new Storage related features in vSphere 5. One of the novelties is that you can now unmount a VMFS datastore and detach a SCSI LUN through the API. To be able to unmount a datastore, some conditions have to be met. 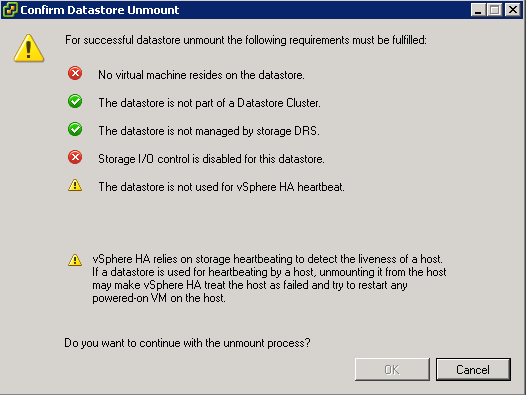 In the vSphere Client you get an informative popup that tells what is prohibiting the datastore unmount. If not all conditions are met, you can not continue with the unmount. Nice feature, but what for those of us that want to automate this ? Update October 28th 2012: Take into account that the datastorecluster is not connected to a host that is part of a cluster. Skip the HA heartbeat test. Update April 23th 2012: Use the RetrieveDasAdvancedRuntimeInfo method to find the actual datastores that are used for the heartbeat.